Q: "Just installed Adobe Premiere Elements 12. Cannot import or open 4K XAVC files taken by A7R II. Updated to the latest version of the app PE 14. The error still occurred. Any help will be appreciated." As far as we know, the XAVC S format differs from XAVC in that it uses GOP codec of H.264/AVC for video file compression which not an ideal editable format for Premiere Elements. Until the new version Adobe Premiere Elements 14 adds native supports for XAVC S, but core i7 is required which means he computer configuration and operation environment should play an important role on this aspect. Adobe Premiere Elements is still an unsolved mystery in that some persons can import 4K XAVC S videos into Elements, while the others can not. In order to make a7R II 4K XAVC S editable in Adobe Premiere Elements, the easy workaround here is to transcode Sony a7R II XAVC S clips into Premiere Elements native format with a best program- iFastime Video Converter Ultimate for Mac, which features high efficiency and seamless conversion. With it, you can do batch conversion from a7R II 4K XAVC S to Premiere Elements more "edit" friendly codec, MPEG-2 in simple clicks of mouse. New formats are constantly added making the Video Converter Ultimate the most user friendly video converter on the market. Enjoy the latest addition to the VCU in the new 4K video format! With 4K, enjoy the absolute best and finest picture quality! Support converting a standard 2D video to 3D! Support enjoy High Fidelity HEVC/H.265 Video on your devices at half the normal file size! The built-in video editor comes with a set of powerful, easy-to-use editing tools. You can transform your videos into a masterpiece with just a few clicks. So, what does the workflow look like? Install and launch the Mac XAVC S Converter and load the XAVC S recordings from Sony a7R II to it. If you want to merge several clips, just need to check the "Merge into one" box. At the bottom of the main interface, click the "Format" drop-down button to select "Adobe Premiere/Sony Vegas > MPEG-2 (*.mpg)" as the output format. 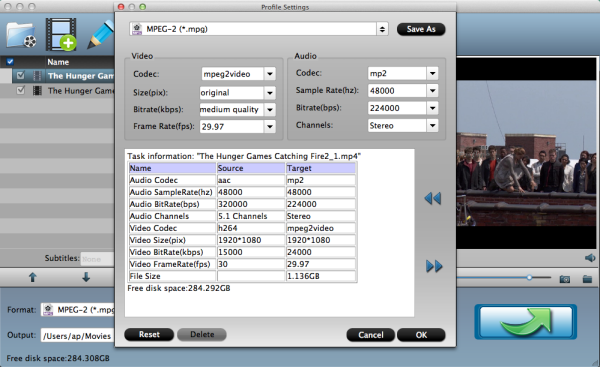 Besides, you can also choose WMV (VC-1) (*.wmv) if you want to get a relatively smaller output file. You can also click the "Settings" button and set detailed output parameters in the open window such as Video Encoder, Frame Rate, Sample Rate, etc. If you want to get original 4K resolution, just keep the video size as original. To down-convert 4K XAVC to 1080p for easy and smooth editing in Premiere Elements, do remember adjusting video size to 1920*1080. That is the exact 1080p. Make sure your computer have enough space to save converted 4K video files. 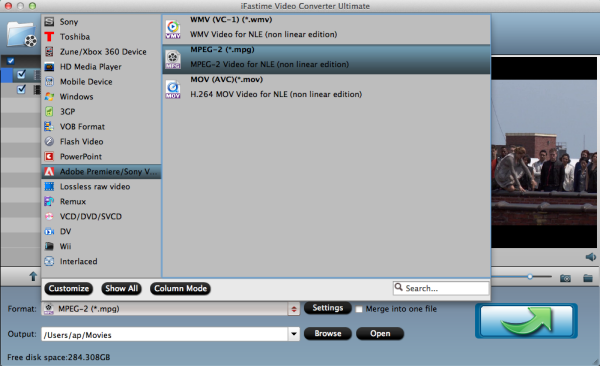 The 4K XAVC S Converter allows basic editing of your XAVC S videos by "Edit selected task" button. Turn to "Trim" tab to clip unwanted video parts, "Crop" to crop unwanted video area, or "Effect" to add effect to you video like adding watermark, adjust video image. This professional 4K XAVC S Converter for Mac allows you to convert Sony a7R II 4K XAVC S video to kinds of NLEs, the workflow is almost the same, just choose a proper output format. If you want to import 4K XAVC S to FCP, please choose the "Final Cut Pro > Apple ProRes 422 (*.mov)" as output; For iMovie or FCE, choose the "iMovie and Final Cut Express -> Apple InterMediate Codec (AIC) (*.mov)". For Avid Media Composer, choose "Avid Media Composer > Avid DNxHD(*.mov)". When you finish the settings, click "Start conversion" button and begin to transcode Sony a7R II 4K XAVC S to Premiere Elements supported format. 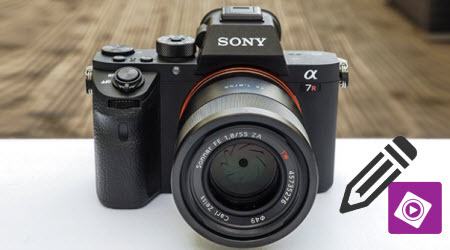 Once the conversion is 100% completed, click the "Open" button to get the converted file and then import the converted Sony a7R II 4K XAVC S file to Premiere Elements 14/13/12 on Mac. Have more questions about how to get 4K XAVC S from Sony a7R II Work in Premiere Elements 14/13/12, please feel free to contact us>> or leave a message below.